All European countries tax corporate income. 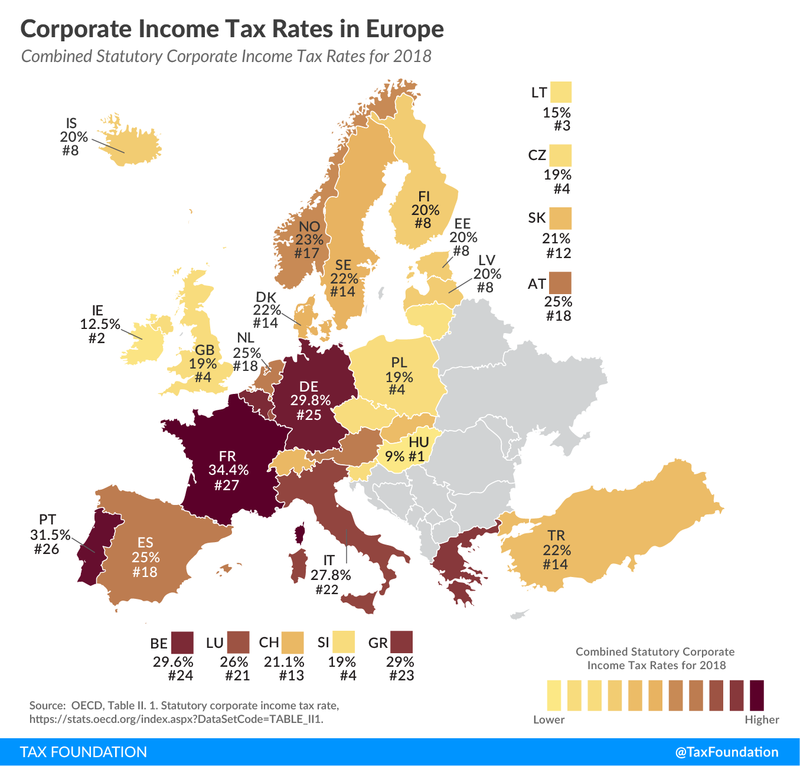 However, corporate income tax (CIT) rates differ substantially across countries, ranging from 9 percent in Hungary to 34.4 percent in France. Europe’s average CIT rate (22.5 percent) is slightly higher than the global average (21.4 percent). The map shows statutory CIT rates in 27 European countries. These CIT rates include the federal, state, and local taxes where there are multiple levels of government. The country with the highest CIT rate is France (34.4 percent), followed by Portugal (31.5 percent) and Germany (29.8 percent). Germany’s rate includes the 15 percent federal rate and municipal trade taxes, making the combined rate nearly twice the federal rate at 29.8 percent. The countries with the lowest CIT rates are Hungary (9.0 percent), Ireland (12.5 percent), and Lithuania (15.0 percent). The majority of European countries tax corporate income at rates that range between 19 and 25 percent. An OECD study from 2008 found that corporate income taxes are the most harmful form of taxation for economic growth. Countries with a lower corporate income tax are likely to grow faster and attract more investment and jobs than high-tax countries. Low CIT rates in Hungary, Ireland, and Lithuania can have a positive impact on these countries’ economic growth. The corporate tax base matters as well, though, since how countries design their corporate tax could hurt their growth prospects even if CIT rates are lowered. A future map will show how European countries rank on measures of their corporate tax base. A recently released OECD database covering 88 jurisdictions worldwide shows that the global average statutory CIT rate was 21.4 percent in 2018. Most European countries impose CIT rates that are either close to or fall below the global average. More insights into the recent history and current state of corporate income taxes around the world are provided here.